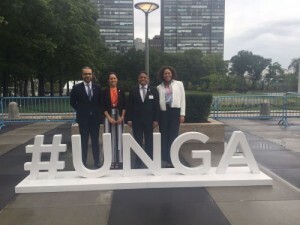 WILLEMSTAD, NEW YORK - Premier Eugene Rhuggenaath is currently in New York to attend the United Nations General Assembly 2017 until September 21st. On Monday, the Prime Minister met with members of the Curaçao community in New York and today he is participating in a debate on poverty reduction. Furthermore, the Premier wants to use his stay to conduct talks with members of the Venezuelan delegation to discuss the future of the Isla refinery and the association with PdVSA.